Fluffy’s Adventures in the Wild have come to a happy end. 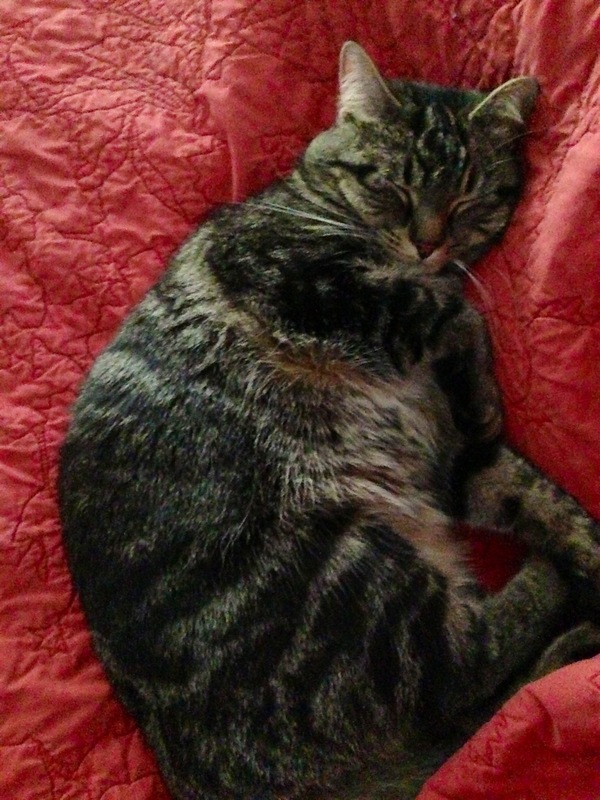 After the wayward cat refills her belly and catches up on her sleep, she will be interrogated and her story will be a matter of public record. In the meantime, thanks to all who expressed concern, assisted in the hunt and provided advice and hope. You know it’s been one hell of a week when it barely registers a blip on the screen that the president and a U.S. Senator both received ricin-filled letters. I think as a nation we gave a collective sigh of relief on Friday night when “suspect #2” was apprehended in Watertown after 24 hours that felt too far fetched for a screenplay, let alone real life. Afterwards, Bostonians on lockdown all day went out for a drink. Or rather, several. I wish I could have joined them. I’ve spent the weekend being especially nostalgic for the city of my young adulthood. Boston is as much where I’m “from” as anywhere. I’d never even been to Boston when I arrived on her doorstep at age 18 for my freshman year of college at BU. But I immediately fell for her charms. Boston is the first place I officially lived on my own. It’s where I experienced first true heartbreak. I made life long friends. It’s where I learned to take public transportation and walk through the city like you mean it. I learned to be hearty. And drink Guinness. I love the accent. It sounds like home to me. I love the Dunkin Donuts on every corner and the absolute worship of ice cream. Ditto steamers. Lobster. Chowder. Head of the Charles. The Beanpot. In Boston, I rented my first apartment. Got my first “real” job after a string of jobs that felt anything but unreal. I learned to cook. Entertain. Mock the weather. I became obsessed with the idea of running the Boston Marathon. And took to the streets every Patriots Day to cheer runners on. I climbed the Citgo sign. Twice. But then I left Boston, seeking professional opportunities I couldn’t get from the place that nurtured me, developed me, fed my soul. I find it somewhat extra poignant that my favorite bar (the Crossroads) closed its doors permanently this weekend. I can only imagine what Saturday night was like. This too shall pass and eventually I will stop torturing my kids with the songs on repeat that remind me of Boston. But until then, good times never seemed so good. Tonight will mark three days since Fluffy disappeared. To keep my spirits up, I’ve been trying to think of it as “Fluffy’s Adventure in the Wild.” But each day gets harder, especially since I have to be the tone setter at home. When little boys cry, I try to remain upbeat. When they say they’re scared they’ll never see her again, I tell them to have faith. 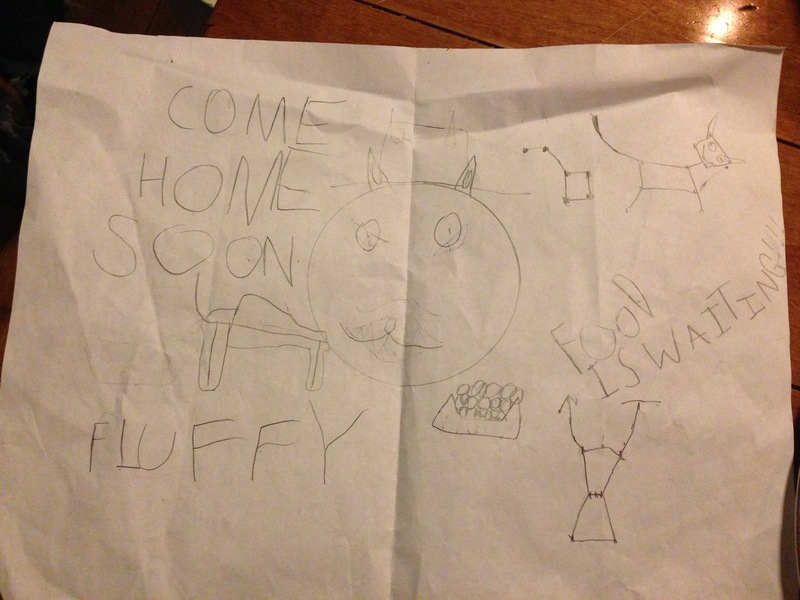 When my younger son showed me the “come home soon” card he made at school, I assured him Fluffy would love it and bit back the tears until after he went to bed. Last night I set traps. The “humane” kind that don’t injure, just capture. I checked them every two hours during the night (and thus am on my third cup of coffee). My haul? 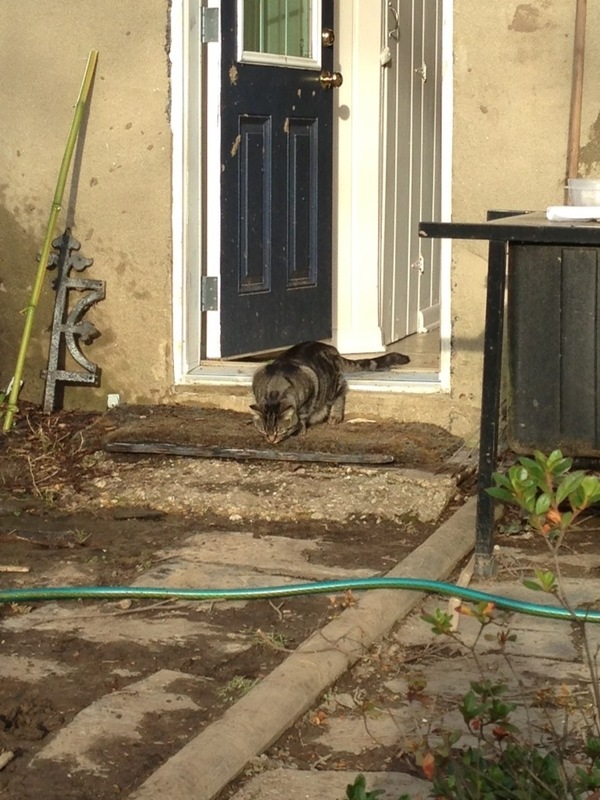 A really angry orange tom cat, a skittish gray and white cat, and in the wee hours this morning, a raccoon. All were immediately freed, of course, and hopefully will be smart enough to not be lured back by the tempting scent of canned tuna. Thank you all for your advice and support. I have talked to neighbors. Posted signs. Filed reports with DC and Prince Georges County animal shelters. I called my vet and the nearest vet to my house. Speaking of my house, yes I’ve checked every nook and cranny. I love your stories of cats that have escaped and been gone several days only to be found close to home. They help and I remind myself (and the boys) of them constantly. Tonight the kids are with their dad and I’m planning a full out assault. More trapping. Crawling in bushes and under houses. Checking the premises of a nearby home that recently experienced a fire and where a tabby cat has been spotted. It’s kind of far for a scaredy cat to travel by paw, but who knows.